Latest word from the park is that the new map "is almost finished", but will not be posted until the new numbering system is in place (date still TBD). They hope to have it all set to go in early October. Anybody seen the new map yet? Would love to see a PDF if one exists. Otherwise, I'll check it out in person in two weeks. I've reserved site 41 so I'm curious to see if that is still the site number for that site...if that makes any sense. reservations being made for the November 15 reservation season. changed but usually only by a couple of numbers from the old site number. those also being reserveable sites. Loop 1, sites 1-18 are the only sites where generator use is allowed. I can't tell if all of these pictures were taken after the renumbering or not. Anybody care to do some QA? Before. My favorite site used to be numbered 41. It's now 21 and the 21 in the picture is definitely not the site I like. That's my story and I'm sticking to it. Cool. 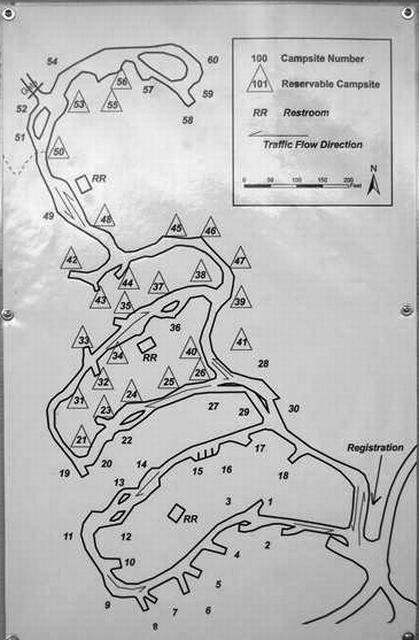 While you're out there, can you confirm the accuracy of my campground map? I thought they were going to move the host's site to up near the entrance. The Host is right across from 23. That makes sense, as I think the generators allowed zone has been restricted to the first loop only. Any other tweaks needed to my map? I gave up waiting for the park to put one online. They seem to be ok with just the recreation.gov interactive map. Any other tweaks needed to my map? Did they really take out the water faucets in the first loop? Seems odd that the second loop has 3 and none in the first. Went back and read the posts from the start and saw the old map with no faucets as well. Odd, I've stayed in the first loop more than 20 times I would guess and I would have remembered hiking more than a couple of campsites to get water. Seems like there was one across road from the new 3 and 4. I doubt anyone with the park went to the trouble to check the locations of the water faucets for the map. I'm guessing they just left the faucet icons in place from previous maps. I guess we need someone to note all of the correct faucet locations and I'll update the map accordingly. The host is actually located where you have #2. There were 2 campers in the host place. One is across from #19, and the other is across from #23. Hmmm, now I'm confused. Maybe I'll let you edit the image and move the sites around as needed. Looking at google earth, I think this closer to reality.